So yesterday was pretty awesome after Andrew posted up the blog. 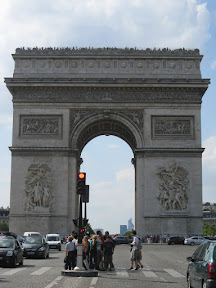 We went and did our self guided tour of Champs-Élysées and the Arc de Triomphe. Our guide book we bought was great and easy to read and navigate on the Kindle. The Kindle is proving to be a great companion when touring sights. I did get hit by a car for the first time this trip and hopefully the last. It hit my handle bars hard enough that his mirror bent inward on his car so he could no longer use it. Fortunately I had a good grip on the handlebars at the time and it didn’t do much more than rattle me. 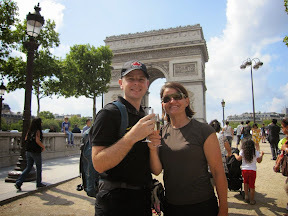 That was our cue that traffic on the Champ Élysées was too busy and we parked the bikes and began our search for champagnes and glasses. A toast to Lori-Dawn and Geoff to celebrate their anniversary. 10 years ago they were here with champagne after being married and had hoped to return to celebrate. As they weren’t able to make it; cheers to you! After doing our tour for a couple of hours we found a great little spot for some happy hour drinks and had some kebab for dinner. It was a pretty nice and relaxing day. Andrew went into the Hugo Boss store to try on some pants. 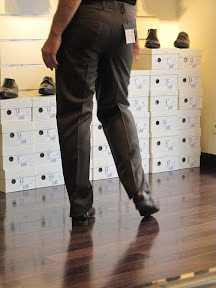 The dress pant for men that is tapered at the bottom is very popular and looks good. And it looks good on Andrew too! And he loved them, and the shoes. Too bad the pants and shoes cost over 300 euro. Apparently Andrew has expensive tastes. 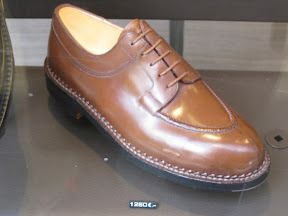 As we continued shopping he pegged these shoes as nice. 1250 euro! I tried to load a video but it won’t work. It was an example of the traffic circles. No lines, no lights. Once you’re in it’s every man for themselves. Seems to work. Essentially it is the equivalent of 6 lanes. We will have to share with people later. 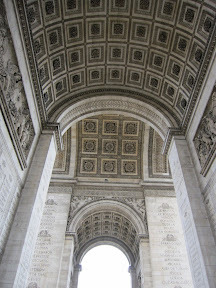 Under the Arc de Triomphe. 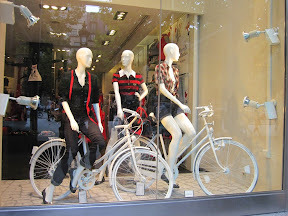 Cycling is so fashionable here it is part of many window dressings in stores. Today we got up around 9 to allow ourselves time to visit the Louvre. We have heard that you would need six months to go through and see everything. We were going to try the “couple of hours” rendition of the Louvre. As with most touristy things we expected lines and figured the earlier the better. We also got a tip from our bicycle tour on a back door entrance to avoid the big line. What an awesome tip! We were through security and inside the Louvre within 20 minutes. The line we walked past enroute to our secret entrance. 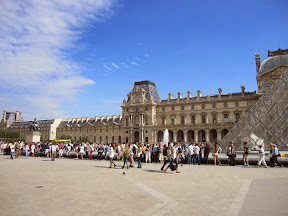 Once inside the Louvre the pandemonium begins. So many people and just not really my thing. We saw the essentials and took some photos. 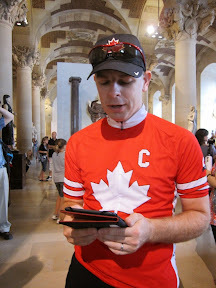 We followed our guidebook on the Kindle and that part was great. The Kindle and the Rick Steves Travel Guide to Paris have proven to be a great investment. The book is totally up to date and catches all the major items. I would highly recommend this book. Essentially it removes the need to take any guided tours. 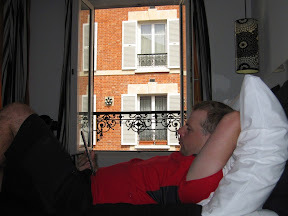 Andrew reading from the Kindle on our self guided tour. 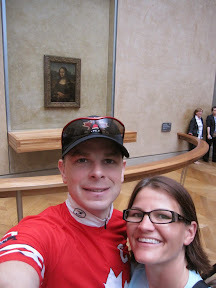 Getting your picture in front of the Mona Lisa is a test of any humans’ patience. After the Louvre we went back to the hotel. Enroute I wanted to check out some souvenir stores. I would love to buy souvenirs for friends and family but it is so hard with the weight restrictions and all our cycling gear. I was trying to find something small but everything is so cheesy. 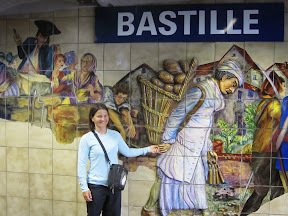 It started raining so we decided to try out the subway system instead of riding. Holy cow! What a maze underground. I thought New York was big when in fact it is nothing compared to the infrastructure in Paris. We found our way to the right line after fumbling with the language barrier and asking two people for help. It was a very good thing that we tried it because we realized we will need to do some serious research before trying to get our bikes in that maze to get to the airport. That or we will have to ride. Back at the hotel with the Kindle.